So much going on. Life is busy, crazy, stressful and fun. First, a photo. Think of what France means to you and what kind of image could sum up France. I came up with this from the amazing town of Le Puy-en-Velay. 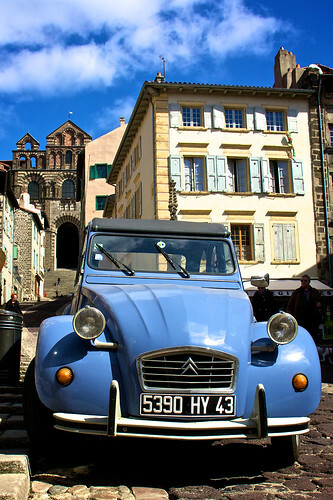 What could possibly be more french than a citroen 2CV against the backdrop of an ancient cathedral. So, a week and no blogging. Bad me. Why? We bought a house!!! Well, everything is signed and just awaiting us to dot the final i’s and cross the final t’s. Sooooo exciting. What house. Where? Why? Who? What other questions beginning with W can I dream up? Lets post the link so you can see yourself. Its an 1850’s cottage which has been updated and extended a bit, on an internal block. 3 bed, 2 bath, garage, deck, garden and all everything we could want. Rob, our property hunter found us this place. We both looked and loved it. We then let him loose to do his magic, and magic he did. An amazing deal was negotiated. No idea how he managed it, but even by his standards this is a ripper. So, with any luck, we might be moving in within about 5 weeks, fingers crossed. Work is getting crazier too. Fun but busier. Exciting.